Who is the politician to whom a corporate transferred Rs.200 crores bribe money in a Mega Power Project approval? Investigating agencies are literally perplexed by a complaint forwarded by the Special Investigation Team (SIT) on Black Money about the mysterious death of one Yogesh Garg in May 2012. Some months before that he had transferred Rs.200 crores from India to his secret London based firm called Infraline. 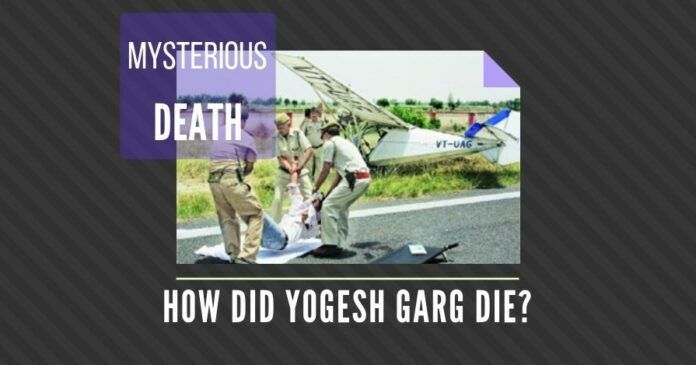 Two facts are before the agencies – One is, as per official records Yogesh Garg was found dead on May 12, 2012, after his Microlight Aircraft hit him while he has taking photos of the landing at Meerut Airstrip. Sound fishy? Two, the owner wanted to take the landing photos of his plane and entered the runway and died when the left wing hit his head. This is the version told to police by the pilot and one passenger inside the aircraft. The Director General of Civil Aviation (DGCA)’s fact-finding report clearly says that it was an illegal sortie by the Aircraft at a small airstrip in Meerut at early morning. Will any fool enter the runway when the flight is landing? Somehow Indian media did not go further into this mysterious death. The second fact before the agencies adds fuel to the fire. In November 2011, this Yogesh Garg had transferred Rs.200 crores from India to an address in London. The Address is: Infraline, 37 Gracechurch Street, London EC3V0BX, United Kingdom. Indian agents in London visited this spot and now say that the post box address is no more. But they confirm that this money is now deposited in the Standard Chartered Bank’s Gracechurch Street branch. PGurus’ friends in London also visited this area many times and spoke to bank staffers and got the impression that this was an old post box address provided by the bank to transfer illicit money from India. The staffers confirmed that many times Indian agents of investigative agencies have approached them to get details of money transfer from India. According to the analysis of Indian agencies, this was the money of a big politician. He got the money from pressurising a state government in Northern India to give environmental clearance to a big Corporate’s Mega Power Project, which was later caught by the Comptroller and Auditor General (CAG) for widespread irregularities. This project was also involved in the Coal Scam but somehow the owner of the big Corporate escaped and is now poking into the Defence Sector. The owner personally transferred money to the big politician who is also an advocate, for getting the state government’s clearances. The politician used the services of the benami to transfer the Rs.200 crores bribe to London. After a few months of the transfer, the benami is no more. Yogesh Garg was only 37 years when he met with an unheard-of-kind-of-accident of flight’s wing hitting him on the runway. Yogesh Garg established a company in India known as Infraline Technologies (India) Private Limited. Incidentally the now untraceable secret London firm also has the same name Infraline. Infraline was basically involved in consulting activities in money-spinning areas like Power, Oil and Energy sectors. Basically, this is nothing more than a firm that does lobbying activities and it was caught for lobbying by the police in 2015. One Infraline staffer was caught by police for lobbying, documents sourcing with government officials. Yogesh Garg opened a small office in 1998 at a residential area in Greater Kailash, which is very near to the powerful politician’s home. From 2000 onwards, fortune started smiling on Yogesh Garg and he started by opening an office in the heart of New Delhi and then built a plush office in Noida. Yogesh Garg also started another organization called Center for Energy Policy Research (P) Ltd to conduct seminars and liason with media. Now his wife Shashi Garg is running the show and is a Director at Infraline. One Shweta Singh is her co-Director after Yogesh Garg’s mysterious death. Shashi Garg is also running her husband’s other firms – Infraline Resorts Private Limited, Rajasthan Aviation Infrastructure (India) Pvt. Ltd. and Black Scholes Capital Advisors Private Limited. Indian agencies also found Shashi Garg’s name in international business registries showing the still untraced London firm Infraline, where Rs.200 crores of bribe money from a big corporate to a powerful politician in 2012 was deposited. The same document showing her name has also been traced by PGurus’ friends in London. What is interesting about this deposit is that way back in November 2011 itself, the United Kingdom (UK) intelligence agencies had tipped their Indian counterparts about the deposit of Rs.200 crores and the officers alerted the then top persons in Finance Ministry! That time the big Corporate that is now meddling in Defence Sector was pumping bribes to all and sundry from major political parties for the approval of this aforementioned Mega Power Project, which was later caught by the CAG. Another interesting thing is that this politician’s opponent raised this money transfer to London based Infraline during the Lok Sabha elections in 2014 in a Press Conference, to which this politician did not answer. The Politician lost the elections. For some people, the Indian media is always soft. Is the Government serious on retrieving the Rs.200 crores bribe money collected from India and parked in the London address Infraline, 37 Gracechurch Street, London EC3V0BX United Kingdom? Will they question the Indian firm that transferred such a huge amount of money in November 2011? Can Yogesh Garg’s death in May 2012 while taking photos of landing be verified? Modi lost a golden opportunity to shutdown the NDTV & its indirect promoter Reliance. But it is still dragging its mind, hands & legs. No will to fight. Reliance is the most corrupt business group in India & it needs to be disbanded. That corporate seems to be Naveen Jindal and the Politician Advocate is Kapil Sibbal who deals in such things. The big politician is most likely to be ‘Shakuni’ (a name frequently used by Dr. Subramaniam Swamy for this politician) who’s permanent address is in Kailash Colony. Rubbish. AJ was not in govt in 2004-14. Secondly, atleast 50 Congis hv addresses of Greater Kailash. arun jaitley they’re referring too!! Modi govt seems to have lost the urge to punish the guilty & now they are supporting the guilty & criminals with their continued silence. Well this is just one example. There are so many stories of sudden rise of benamis who are involved in all kinds of underworld activities including gulping properties wherever possible. One example is a prominent turncoat minorities community politician who runs educational institutions in PCMC (Pune) now in BJP from PCMC. Benamis who were literally at the most lowest of the economic strata of the society are now purchasing properties in PCMC. BJP is full of such crooks. Can PGurus look expose such corrupt people and hence let the common man know what BJP’s true colours are? Who is the lawyer politico living in Greater Kailash ?? ?